After much preparation and anticipation, the inaugural branch of Pie Tap Pizza Workshop + Bar is set to open, but perhaps not where you might expect: the Dallas Design District. The pizzeria concept from Mooyah co-founder Rich Hicks will debut on or about August 1, in a handsome building at 1212 Oak Lawn Ave. which was at one point a health club called the Majestic Spa. It will serve pizzas, pastas, beer, and wine, all available onsite or via delivery to your door — meaning you can get a complete meal with wine or beer included, even a six-pack if you like, a delivery option that's unique. The Design District location might be a surprise if you've been following the Pie Tap saga, which began in 2014 with construction on Henderson Avenue. That location was slated to open in 2015, until the city of Dallas and neighborhood groups got involved, with concerns over parking and other invisible potential problems. They've resolved that situation and that location will open in the next few months; but meanwhile, Hicks found a location he loved in the Design District. "I liked everything that was happening there, with restaurants like Oak and Pakpao, Meddlesome Moth and Ascension Coffee," Hicks says. "We're a culinary-forward brand, and we'll have Town Hearth, chef Nick Badovinus' new restaurant, as our neighbor. I felt like we'd fit in nicely with the neighborhood. And it's really up and coming, with Virgin Hotel & Residences opening. It's going to keep getting better in the future." Running the culinary side for Pie Tap is Giovanni Mauro, a veteran chef and pizzaiolo who has owned restaurants such as Old School Pizzeria and Nora's Wine Bar in Las Vegas; he and Hicks worked together back in the early days of Romano's Macaroni Grill. Gabe Sanchez, owner of Black Swan Saloon and repeat Tastemaker nominee, is creating their cocktail menu. Mauro stresses that the most important thing about pizza is the dough. "Without great dough, you can't have great pizza," he says. "The idea that the crust is simply a vehicle for toppings is the wrong approach. There has to be a perfect balance of sauce and topping, but you have to have a commitment to the dough. If dough is everything it should be, the pizza is stellar." They're using ovens from Italy that spin, to achieve a crisp crust. "This allows us to focus on building the pizzas on our exceptional dough and lets the oven do the work to evenly crisp the crust," Hicks says. Mauro, an early participant in the Slow Food movement, takes a sacred approach to dough. "It's the kind of dough our great-grandparents used to eat," he says. "It's a very natural, slow process. We don't use any commercial yeasts. We started a 'mother dough' with a starter that's proprietary to us. It's a five-day process, an absolute minimum of 96 hours, from when we start to when we put the pizza on the plate." They've even named their starter after an important Dallas personage. "Because this is a Dallas concept, and because I'm a Cowboys fan, we decided to name the starter 'Romo,'" he says. "It's a tradition done with bakers in Italy to name your starter, because of all the care it needs. You have to take care of it like a baby. You have to feed it and keep it at the right temperature and make sure it's in a dark and cozy spot. "People joke with me that other folks have cats, and I have a few yeast cells — those are my pets," he says. Their models include celebrated California baker Nancy Silverton and renowned pizzaiolo Chris Bianco, owner of acclaimed Pizzeria Bianco in Phoenix. 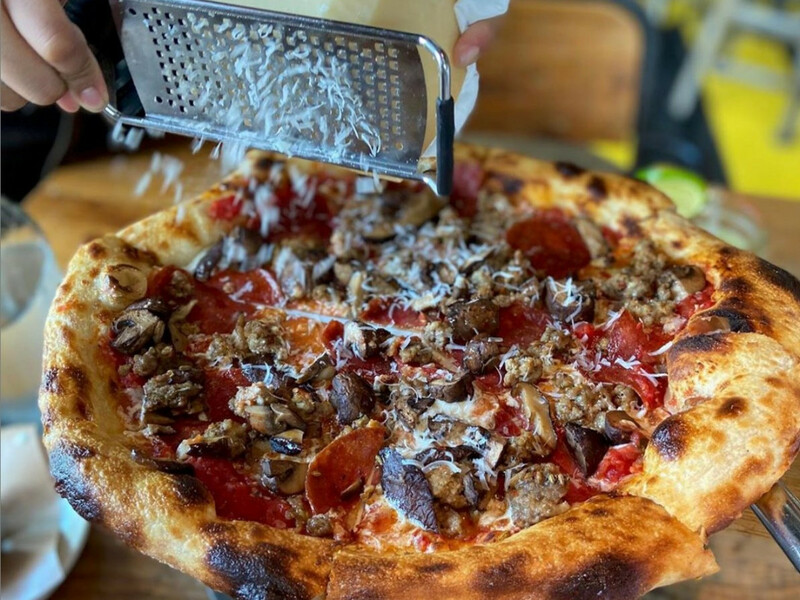 They're using the best sourced ingredients or making their own, from handmade pasta to house-made fennel sausage to what they say is the best pepperoni they can find. Unique pies include one with prosciutto and a unique date cream sauce that brings together flavors salty and sweet. "We're keeping it simple, with about 25 items on the menu, and a focus on doing a few items really well," Hicks says. "It's a very Italian approach to cooking," Mauro says. "Show your best ingredients, don't mess them up, and let the ingredients speak for themselves."